Corals are the building-blocks of mid-ocean oases of life, and play a key role in promoting biodiversity in every ocean on Earth. A large part of the world’s total biodiversity would be degraded to an extent never experienced in human history if coral reefs were to go extinct (Veron et al. 2009). With increasing threats from global climate change, ocean-acidification, turbidity resulting from deforestation and urban development, eutrophication from agriculture runoff, overharvesting, predation, and disease, it is critical to understand the physiological plasticity of corals. However, corals display unique challenges for physiological examination as a result of photosynthesizing zooxanthellae living symbiotically in tissue. During the process of photosynthesis within corals, photons of light are absorbed by chloroplasts located in zooxanthellae and the byproducts of fluorescence, heat, and photochemistry are produced. These byproducts are competing pathways for the de-excitation of chlorophyll, which means if heat production is assumed to occur at a constant rate, monitoring fluorescence will allow insight into the yield of photochemistry or energy transfer within the photo-system. For some time now botanists have utilized fluorescence emission to examine the yield and efficiency of photosynthesis in plants, and more recently similar methods are being used to examine photosynthesis occurring within corals. Fluorescence decay or transient, also known as the Kautsky effect, was first described by Kautsky and Hirsch in 1931 and provides crucial information about energy transfer and nutrient production in primary producers. The Kautsky effect describes a rise in fluorescence resulting from illumination, which decreases with exposure time as more electrons can be converted to photochemical energy. Because fluorescence emission is proportional to absorbed light, and at room temperature most fluorescence (~90%) results from Chl a emission within photosystem II (PSII) (Krause and Weis 1991), quantum yield of photosynthesis can be derived simply by examining and comparing fluorescence levels among different light- or dark-adapted states. Pulse amplitude modulated (PAM) fluorometers are now available for recording fluorescence, which only record after a pulse of light with known intensity and wavelength, permitting recordings in all lighting situations without ambient influences. These units also come with computer software which provides the ability for automatic light sequences to determine different fluorescence variables. 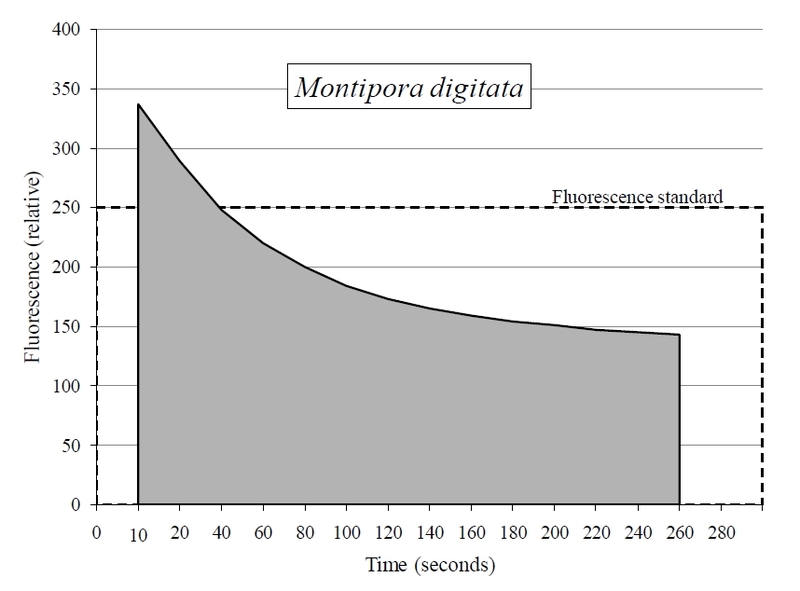 For example, when a dark-adapted sample is subjected to a weak-intensity measuring light there is minimal fluorescence (FO), but an intense, saturating pulse of light will yield maximum fluorescence (FM); variable fluorescence can then be calculated using the difference of maximum and minimum fluorescence (FM-FO=FV). The ratio of maximum to variable fluorescence, known as maximum potential quantum yield (FV/FM), is known to reflect the efficiency of PSII (Krause and Weis 1991) and has been used to determine photosynthetic productivity within plant physiology (Maxwell & Johnson 2000). This ratio is also an accepted indicator of stress in corals (Jones et al. 1999), and represents fluorescence in the absence of photochemical quenching; wherein the process of energy harvest is not limited by electron acceptors. Therefore, FV/FM essentially reveals the maximum potential of light capture occurring within the photo-system at any time. to examine the effect of aquaculture temperatures on FV/FM of four species of coral. A brief summary of fluorescence variables measured with relation to photo-system state and overall physiological importance is presented in Table 1. For a more in-depth description for interpreting fluorescence information see Maxwell and Johnson 2000.
plant or algae sample during examination. The application refers to the WinControl3 software program used. 1 PSII-photosystem two of the photosynthesis complex; relates to a pair of chlorophyll molecules which are excited by 680nm light (P680). P680 is involved in photolysis (the splitting of H 2O) and exciting the primary accepting molecule at the start of the electron transport chain. 2 Maxwell and Johnson 2000. 3 Values are relative because they were calculated using WinControl3 software and not actually measured. The temperature for the above-mentioned system was monitored by an YSI controller with the ability to detect a 0.2°C temperature differential; this monitored the function of two controllers (one for the heater, and one for the chiller) which each regulate within a 1°C range. Each aquarium was equipped with a Coralife digital thermometer to measure temperature within each tank. The system’s temperature was systematically increased by 2°C every 3 weeks from 22 to 28°C to sample a range of typical aqua-culturing temperatures. Throughout each treatment, manual tests were performed routinely to monitor calcium, alkalinity, pH, NO2, NO3, and ammonium in addition to temperature. Alkalinity, calcium, and salinity were maintained using SeaChem raises alkalinity-, raises calcium-additives, and Red Sea aquarium salt, respectively. All fluorescence measurements were obtained using the Junior- or JR-PAM (Walz, Effeltrich, Germany), equipped with a single 100cm plastic fiber, 1.5mm in diameter. It should be noted that the photosynthetically active radiation (PAR), referred to here as photosynthetic photon flux density (PFD), for all data were not corrected for length of fiber optic used. Values represent PFD emitted using a 400cm fiber, which may result in a misrepresentation for values for PFD. Nonetheless, the photosynthetic information gained remains proportional. All data was analyzed using PAM WinControl-3 software, using a blue (450nm) LED for measuring light, actinic light and saturating pulses. To determine the precision of the JR-PAM the amount of distortion occurring with distance and medium (air or water) was examined. The fiber optic tip of the fluorometer was adjusted using a small ruler and the fluorescence standard foil provided with the fluorometer was used as a constant. The fiber optic tip was adjusted accordingly using a leaf clip provided with the unit, which orientates the tip 60° from the sample. Signal was recorded from 1-10mm in 1mm increments. After distance adjustments were made the signal was tested in both air and water. To determine the efficacy of the JR-PAM fluorometer for examining aquatic, photosynthetic organisms multiple known photosynthesis-dependent organisms were tested. Since all organisms containing chlorophyll display characteristic fluorescence decay upon illumination, fluorescence was simply monitored for a brief period of time during the onset of illumination within algae (coralline and filimentous), jellyfish (Cassiopeia xamachana), and multiple coral species to determine if the JR-PAM could detect a typical Kautsky fluorescence transient underwater. The change in mass of each coral fragment was monitored using a digital scale accurate to the .001 gram. Each fragment was fully cleaned prior to weighing by brushing off the plug with a tooth brush to rid the measurements of accumulated algal mass. Samples were suspended out of water for approximately 10 seconds to drip dry, and any excess water droplets were removed with a light shaking. Samples were then weighed in a known amount of water, and the combined weight of both coral and plug was measured. Mass was recorded at the beginning and end of each 3 week temperature treatment and change in mass was calculated. Rapid light curves (RLCs) were used to determine maximum and relative electron transport rate (rETR), and dark-adapted induction curves were used to examine maximum quantum yield (FV/FM). RLCs consisted of exposing light adapted coral samples to increasing photon flux densities (PFD) from 66-820 µmol photons m-2·s-1 to fully saturate and in most cases, over-saturate the photo-system. Induction curves were used to determine minimal fluorescence (FO) and maximum fluorescence (FM), which were required for the determination of maximum potential quantum yield (FM-FO/FM) or (FV/FM). Induction curves were recorded at night, with samples having ≥30 minutes of acclimation to darkness (0 µmol photons m-2·s-1). All recordings were taken ~1mm from the sample’s cenosarc, and the coral was lightly touched to retract polyps in an effort to account for known variations in photosynthetic activity between the two parts of the corals’ external anatomy (Ralph et al. 2002). 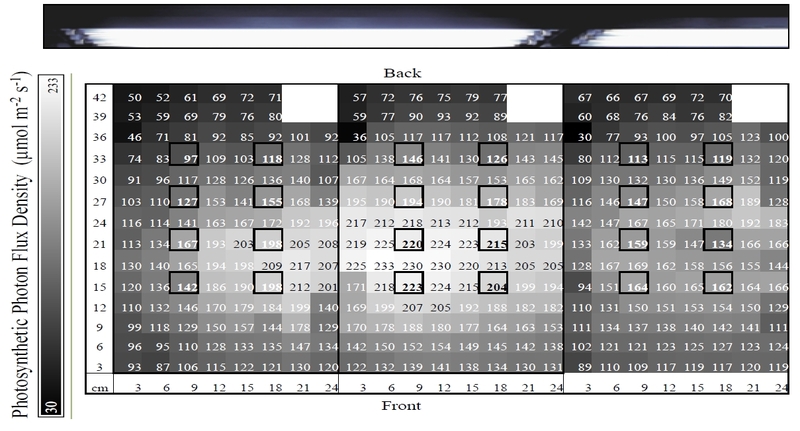 Each sample was maintained under a PFD ranging from 97 to 223 µmol photons m-2·s-1 based on location in tank, resulting from the distribution of electric bulbs (figure 1). Mean intensity of samples’ local light habitat was 161 ± 36 µmol photons m-2·s-1. Average temperature per designated treatment was maintained, at most, within 0.7°C of intended set-point (Table 2). Water parameters (pH, calcium, nitrates, nitrites, and ammonia) did not significantly vary across treatments, with the exception of alkalinity (F=3.7, df=3, p=.02) (figure 2). Figure 1. A light distribution map for three 10-gallon tanks containing coral fragments displaying micro-habitats of light, with values representing photosynthetic photon flux density (PFD) in µmol photon m-2·s-1. Bold boxes represent locations of coral fragments, which are located ~16cm below the surface. Lights were 23cm above the water surface and positioned as indicated by photo above light map. Table 2. Results from routine water quality tests displayed by temperature treatment. – Values +/- standard deviation. – Nitrates, nitrites, and ammonia were also tested routinely, but were undetectable throughout treatments. Figure 2. Alkalinity levels of the system experienced a significant drop after the first treatment (F=3.7, df=3, p=.02). Treatment 1 is synonymous with 22°C, 2 with 24°C, 3 with 26°C, and 4 with 28°C. The drop resulted from a known precipitation event occurring within the saltwater mixing tank used for water changes, and temperature is not believed to have played a role. Therefore, alkalinity is displayed by treatment and not temperature. Applying the terrestrial JR-PAM fluorometer underwater resulted in an intensification of signal (figure 3). Figure 3 also displays the effect distance has on signal, which declines exponentially in either medium with distance from 1-10 mm of the fiber optic sensor’s end. Also, all photosynthetic, aquatic organisms examined with the JR-PAM in situ clearly displayed the Kautsky effect of photosynthesis (figure 4). Figure 3. Applying the ‘terrestrial’ JR-PAM fluorometer reveals a slight distortion in reception. 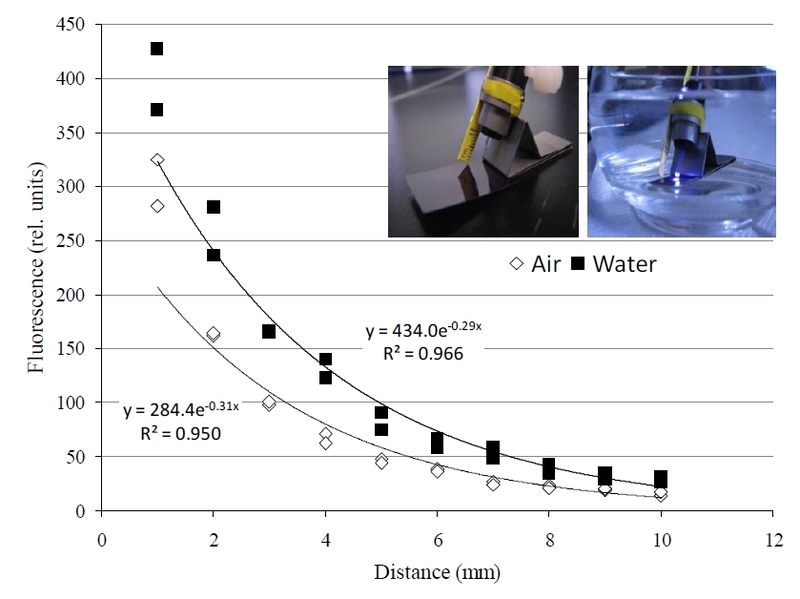 A higher signal is received in water when compared to the much less dense medium of air, which is actually beneficial; allowing for similar accuracy from a slightly further distance. Figure 4. The JR-PAM fluorometer records fluorescence decay in the photo-system of Montipora digtata in situ. This allows for further analysis of photochemical and non-photochemical quenching occurring within photosynthesis using known relationship between variables. The above example uses a fragment of M.digitata to display what is known as the Kautsky effect or fluorescence transient. Sample was dark acclimated for >30 min prior to induction curve. There was no correlation between FV/FM and change in mass for any of the species examined. 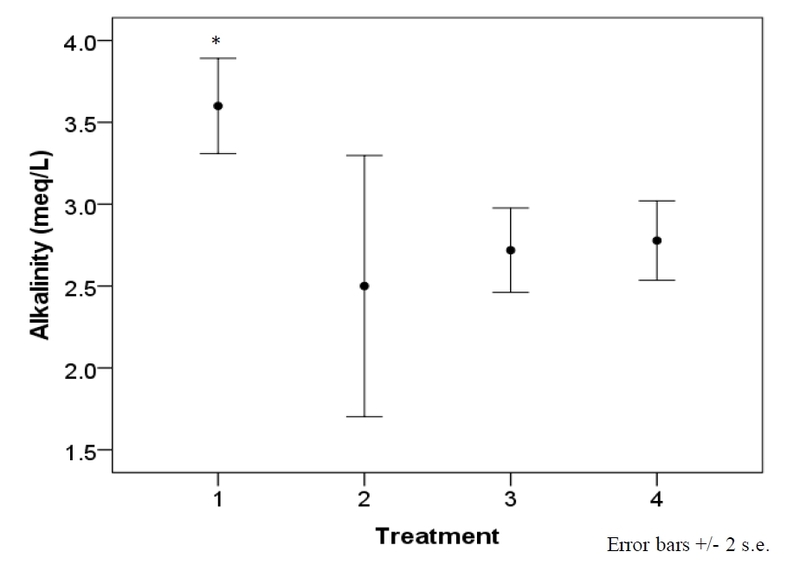 The majority of corals increased in mass throughout the experiment (figure 5), however S.hystrix experienced substantial decline in mass and ultimately all six samples representing the species died over the course of the experiment (figure 5d). Coral growth was also not significantly influenced by maximum rETR or temperature within this experiment. Figure 5. The overall trend of coral growth is obviously increasing; however there are multiple instances of corals losing mass. Samples A-D of each species are represented by the left, y-axis, with fragments E and F represented by the right, y-axis due to a difference in ‘plug’ material: ceramic v. acrylic. A disconnect in lines indicates that the growth between points may have been altered, generally due to fragments requiring re-gluing. Vertical lines indicate a change in temperature. Both maximum rETR and FV/FM varied significantly among the four temperature treatments and a consistent, reduction of FV/FM was observed among all species when exposed to the lower-end of temperature range (figure 6). The extent to which FV/FM decreased varied among the four species examined. Pavona decussatus displayed the most variable FV/FM with a dramatic reduction in FV/FM during the 22°C treatment (F=8.7, df=3, p=.001; ANOVA). A similar effect was seen with M.digitata (F=5.0, df=3, p=0.010) and S.hystrix (F=12.9, df=3, p=.032), though small sample size for S.hystrix should be considered when interpreting results. Acropora sp. 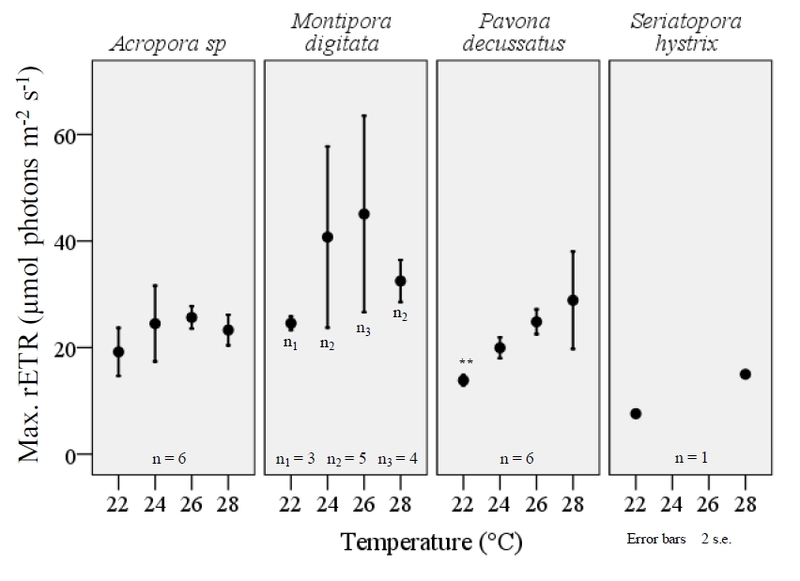 displayed a similar, significant variance in FV/FM among the temperature treatments (F=3.7, df=3, p=.030), but unlike the other three species the largest decrease occurred at 28°C (figure 6). 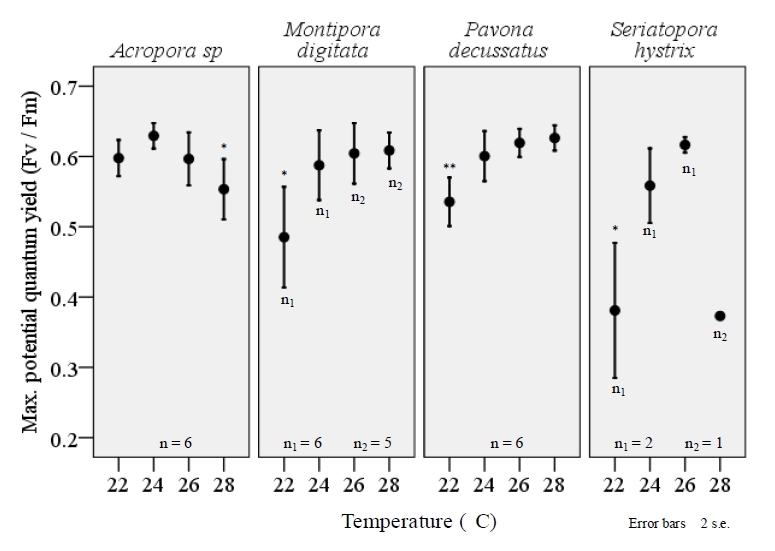 Lower temperatures also resulted in a significant decrease in maximum rETR within P.decussatus (F=7.2, df=3, p=.002), however Acropora sp., M.digitata, and S.hystrix did not display a similar variance between treatments (figure 7). When RLCs from all species are examined collectively, there is clearly a significant effect on the shape of the curve with regard to temperature treatments (figure 8). The rETR of corals was significantly higher during exposure to relatively higher intensities of PFD, but the relationship was significantly affected by temperature. Again, the highest values for rETR occurred within the 26°C treatment. Figure 6. The maximum potential quantum yield (FV/FM) of corals within their typical aqua-culturing range reflects a significant decrease in efficiency of PSII within M. digitata (F=5.0, df=3, p=0.010), P. decussates(F=8.7, df=3, p=.001), and S.hystrix (F=12.9, df=3, p=.032) when maintained at 22°. Acropora sp. also displayed a significant variation in FV/Fm (F=3.7, df=3, p=.030), however the largest decrease was seen during the 28°C temperature treatment. All fragments were acclimated to temperature changes for a three week period prior to examination using the JR-PAM fluorometer. Recordings were taken at a distance of ~1mm from the cenosarc, with polyps retracted. Induction curves using PAM WinControl3 software were performed to determine FV and FM, using samples that were acclimated to darkness for a period of ≥30 minutes. One-way ANOVA (SPSS) *p<0.05, **p<0.001. Figure 7. The maximum, relative electron transport rate (rETR) was less affected by temperature in comparison to FV/Fm within typical aqua-culturing temperatures. 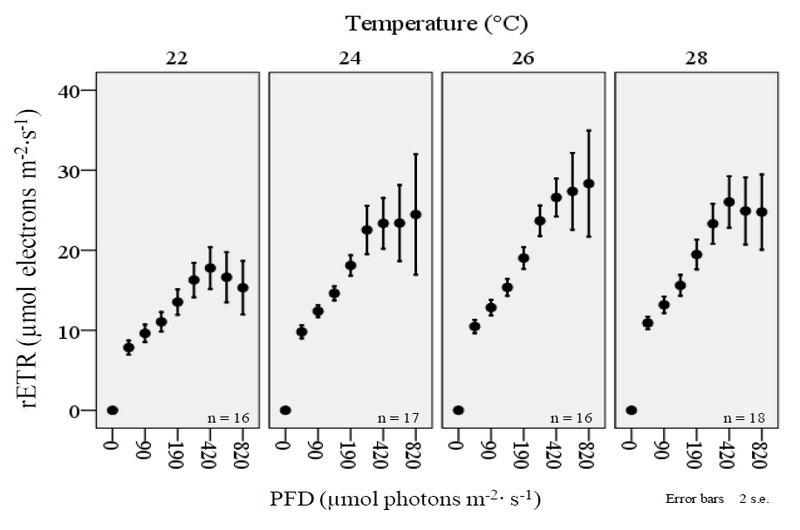 However, the max rETR within P.decussatus was significantly decreased with temperature (F=7.2, df=3, p=.002), and the photosystem appears to function proportionally to temperature within the examined range. All fragments were acclimated to temperature changes for a three week period, prior to examination using the JR-PAM fluorometer. Recordings were taken at a distance of ~1mm from the cenosarc, with polyps retracted during daytime illumination. Max rETR was determined by rapid light curves (RLCs) using PAM WinControl3 software with samples being exposed to increasing PFD intensities from 66-820 µmol photons m-2 s-1. One-way ANOVA (SPSS) *p<0.05, **p<0.001. Figure 8. 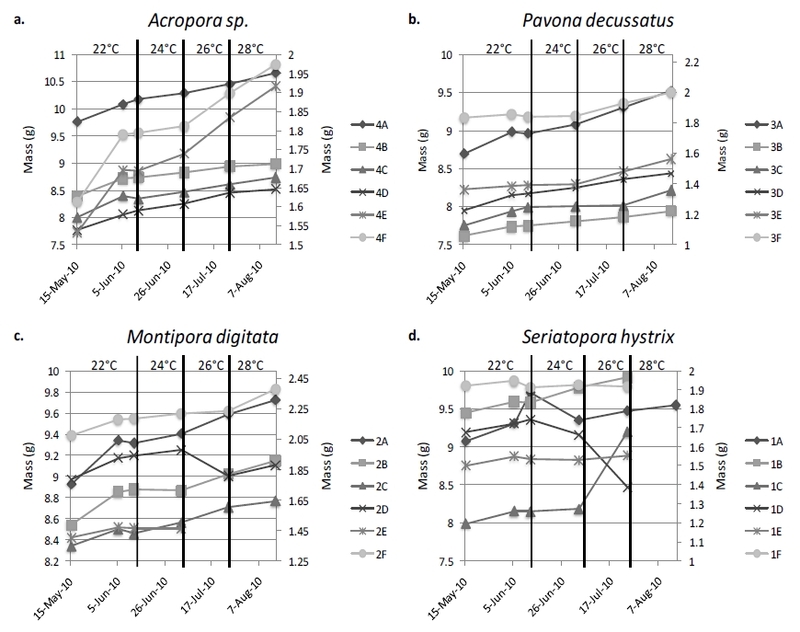 A collective examination of rapid light curves (RLCs) from four coral species (Acropora sp., Montipora digitata, Pavona decussatus, and Seriatopora hystrix) displays a decrease in rETR during exposure to relatively higher photon flux densities (PFD) within the 22°C treatment. Light curves were derived with the JR-PAM fluorometer using PAM WinControl3 software. The aquaculture of corals has seen many technological advances in recent years. New ways of moving water through systems using synchronous wave-makers are now available to simulate tidal fluxes and diurnal variations in flow similar to that experienced in the natural environment, and advances in controlling and dosing for water parameters allows long-term stability of systems, opposed to daily variations in temperature, salinity, and pH regularly seen in earlier aquaria. Lighting has also become more intense and efficient, and may finally be enough (in most cases more than enough) to maintain even the most light-dependant organisms. Though this technology has been the source of advancement in the aquaculture of corals, a lag persists in photo-physical examination to ultimately judge the ideal environment for a given species of coral. Though the underlying concepts of fluorescence and quenching in photosynthesis remain complex and have generated some debate (Maxwell and Johnson 2000), the application of PAM fluorometry itself is straightforward. The technique has been widely accepted and utilized in photosynthesis studies. By following simple protocol, one can accurately gage the efficiency of a photosynthetic organism, but more importantly, gain an understanding of what exactly is affecting the photo-system. Laboratory experiments make controlling the state of photosynthesis (light v. dark) very simple, and can provide crucial information for understanding the effects an environment may have on coral and other photosynthetic organisms. The JR-PAM fluorometer provided rapid results. Controls and functioning are simple, and the unit allows inexperienced users the opportunity to record very in-depth, physiological information. The ease of recording does not reflect the ease of interpreting the measurements however, and the chemical reactions of photosynthesis should be well understood in order to properly apply any fluorometer; see Maxwell & Johnson 2000 for further details. When the fluorometer was applied to aquatic, photosynthesizing organisms, the Kautsky effect was clearly visible across all photosynthetic phyla examined (Cassiopeia xamachana, Tridacna sp.,and coralline and macroalgae algae species), which is accepted within this experiment as evidence that the JR-PAM is applicable for examining biological-fluorescence underwater. If cost is of concern, the JR-PAM is perhaps the least expensive method of examining photosynthesis in aquatic organisms. Costing around $3,000 per unit, the JR-PAM is ~$17,000 less than the only advertised waterproof model the DIVING-PAM. The JR-PAM is not fully submersible, unlike the DIVING-PAM, however the fiber optic sensor is. The application of the JR-PAM is restricted by fiber optic length and dependent on a computer for power, but the unit still remains a very useful and cost-friendly tool for examining photosynthesis within the laboratory environment. The growth and productivity of photosynthesizing corals is dependent on a number of environmental variables. Though an attempt was made to maintain water parameters consistent through the 12 week experiment, an untimely drop in alkalinity resulted from a precipitation event occurring within the saltwater mix-tank used for water changes after the first temperature treatment (22°C). While growth in this experiment was apparently not related to FV/FM, it should be noted that alkalinity and temperature co-varied throughout treatments. Variation of alkalinity within this experiment, though remaining within recommended levels, should be considered when interpreting results. A large and much generalized range of temperatures are recommended for maintaining corals in aquaria, and rightfully so considering their extensive range in nature. However, in order to maximize production of corals, minimize the costs of operations (ex. heating and lighting), and ultimately provide an optimal environment for corals in captivity we need to properly assess their health. Given that FV/FM is a good indicator of stress in corals, PAM fluorometry seems appropriate for finding the conditions in which any given species thrives. The organisms in this experiment revealed optimum temperatures for four species held in the Alaska Pacific University lab, from which we can see that what is best for one species may not be true for another held in the same system. For example, as Pavona decussatus and Montipora digitata appear to thrive at a temperature of 28°C, Acropora sp. displays a significant reduction in FV/FM indicating it would be better maintained in a slightly cooler environment. From information like this institutions can run aquariums according to most efficient temperature and lighting, and know the effect it will have on inhabitants. Also, aquariums can be arranged with corals that thrive at similar temperatures to ensure maximal production in aquaculture, which would ultimately reduce the demand for collection of wild corals. I sincerely thank Professor David Scheel of Alaska Pacific University for his continued support and dedication to students, the Alaska Pacific University’s environmental science department and aquarium lab (as part of the BP science center) for providing a suitable environment for test subjects and JR-PAM fluorometer, and Alaska Coral Fanatics (Anchorage, AK) for providing corals for fragmentation. I would also like to acknowledge the At-sea Processors Association for funding of additional supplies. Jones, R.J., Kildea, T., and Hoegh-Guldberg, O. 1999. PAM chlorophyll fluorometry: a new in situ technique for stress assessment in scleractinian corals, used to examine the effects of cyanide from cyanide fishing. Marine pollution bulletin. Volume: 38, No. 10, pp. 864-874. Krause, G.H. and Weis, E. 1991. Chlorophyll fluorescence and photosynthesis: The basics. Annual review of plant physiology and plant molecular biology. Volume : 42, p.313-317. Maxwell, K. and Johnson, G.N. 2000. Chlorophyll fluorescence – a practical guide. Journal of Experimental Botany, Vol. 51, No. 345, p. 659-668. Ralph, P.J., Gademann, R., Larkum, A.W.D., Kuhl, M. 2002. Spatial heterogeneity in active chlorophyll fluorescence and PSII activity of coral tissues. Marine Biology. 141: 639–646. Veron, J.E.N., Hoegh-Guldberg, O., Lenton, T.M., Lough, J.M., Obura, D.O., Pearce-Kelly, P., Sheppard, C.R.C., Spalding, M., Stafford-Smith, M.G., and Rogers, A.D. 2009. The coral reef crisis: The critical importance of <350 ppm CO2. Marine Pollution Bulletin 58. p.1428-1436.